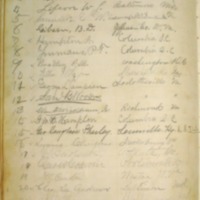 List of members of the Jefferson Society for 1879-1880 and 1880-1881. A notation in the margin reads: “Left College”. University of Virginia. Jefferson Society, “Jefferson Literary and Debating Society Roll Book,” 1879 September 1, WWP17244, Jefferson Literary and Debating Society Records, Woodrow Wilson Presidential Library & Museum, Staunton, Virginia.